Surviving | Who or What Was That? One of the areas I looked at was my wardrobe. I researched capsule wardrobes and was initially intrigued, and then overwhelmed, and then stifled. Making my life simpler does not include rotating cloths for the seasons. Making my life simpler does not include mono-toned colors and patterns and accessorizing with scarves, purses and shoes. Making my life simpler does not include checklists to make sure my wardrobe is “complete”. Don’t get me wrong – I am aware that capsule wardrobes are huge and people seem to love the idea. I personally don’t know anyone who uses one – but that doesn’t mean the idea is wrong. It’s just wrong for me. I live in a location that doesn’t require rotating cloths for seasons (in Texas we have chilly, cool, just perfect, hot, sticky hot, and hot as hades weather – sometimes in the same day!). I love color and sparkles. I loathe scarves (I have no idea how to wear them, and with my extra-large girls hanging out on my chest, I don’t need any help accentuating them), I have just a couple of purses that I love and my shoes must be comfortable, yet cute. I love checklists – so much so that Hun groans whenever I talk about one. But one for clothes? Come on! There is a thing as too much of a good thing (if it works for you – great! I’m not knocking that or you – it just isn’t necessary for me). So…I didn’t do anything with my wardrobe except clean it out when Marie Kondo’s book, “The Life-Changing Magic of Tidying Up” stormed the world. I actually bought her book about a month before it really took off. I felt like I was on the cutting edge! Everything that I didn’t love left my closet. There were a couple of pieces of clothing I had to keep due to work requirements, but everything else that I didn’t love – gone! Three large trash bags of cloths were donated to charity. I was left with about 20 shirts, 7-9 pairs of pants/skirts, 4 sweaters/jackets and 2 dresses hanging in my closet. I could move my hangers freely. My clothes could “breathe”! At the point that I cleaned out my closet, I worked in a position that required uniforms – but before that I worked in an office that was business casual. I kept everything that I could still wear as a weekend/after-hours outfit. When I switched jobs about a year later, the business casual outfits were once again in use full-time. I started to panic that I didn’t have enough work cloths. It bothers me to wear the same thing every week to the office. It depresses me and affects my mood. But since I was only working part-time, I could not justify the added expense of new cloths. I thought nothing of her comment at the time other than to realize – people really don’t pay much attention! But…then something else happened recently. Not exactly – the closet and my system “plans” the outfits for me. And that is when I realized that my “capsule wardrobe failure” is actually a success. Most of my shirts will pair with most of my pants/skirts. Most of my sweaters/jackets will pair with most of my outfits. My shirts are my accessories with the colors, patterns and bling/sparkles. All of my clothes can be dressed up or dressed down – depending on the occasion. My solid royal purple shirt goes well with my grey pants, black pants, white pants, jeans, shorts and black and while patterned skirt. Each time I pair it with a different bottom, it is a new outfit. My tie-dyed inspired pink, brown, orange and white shirt goes well with jeans, shorts and either my brown or white pants. Paired with a brown sweater, it’s a whole new look. I wear the clothes that are “closest to the back” today, each day. By doing this – each item is worn on a regular basis. Why don’t I just pull from the front? Because that’s where I hang the clothes that I just washed – pushing the older clothes to the back of the racks. Isn’t that what most people do with their freshly washed clothes? If I pulled from the front – I’ll be wearing the same items I just wore this week – and I abhor wearing the same thing over and over again! Why don’t I just put the freshly washed clothes in the back? Because doing that would cause my “special occasion” clothes to eventually make their way to the front – where I don’t want to see them when I first walk in the closet every morning (I know…I know…picky picky picky!). Do you want to see your ski pants or ugly holiday sweater in July? Besides – I’m usually rushing to hang clothes up just to be done with laundry – I don’t want to think about how to hang the cloths up any more than I want to spend time thinking about what I’m going to wear each morning. So…how long does it take me to pick out my clothing each morning? Depends on the day. I spend more time thinking about what I want to wear on the weekends and my days off than I do on work days. On work days, it takes me about 30 seconds to go to the back of my closet, skip the “special occasion” tops, grab the first top that was worn the longest ago, pair it with a bottom and decide if I want a sweater or jacket or not (usually yes – our office is FREEZING!). On weekends, I consider what I’m doing that day, who I might see, where I might go, what I might do, what kind of mood I’m in, what the weather is going to be like where I’ll be, and if there is anything “special” about the above. Will I need a change of clothes, should I layer, did I wear this to that event last time, and on and on and on. So there you have it – my solution to my capsule wardrobe failure…uh…I mean…success! I’ve been away a while. I needed to be. I needed to figure out what I wanted from my life and what I wanted to do with myself. I’m still a wife and mother. I still work. I still have a home, bills and everything that comes with life. I still have depression. I am still searching for my own happy place. I have been listening to podcasts more and more lately. I switched jobs back in August 2016, which has lead to a longer commute (funny how 3 extra miles gained 20 extra minutes to my drive time). These podcasts focus on productivity, time management, business, and simplicity. Simplicity – it seems like such an easy thing to accomplish. However, the reality is that it can be very elusive. So, as I focus on simplicity, the theme that has come up more than anything is goals for the new year. Resolutions have never really worked for me. I wasn’t sure why, but one of the podcasts I listened to brought some clarity to me and I plan on exploring the thought process in depth in the near future. So, if I cannot seem to make resolutions work for me, how can I set goals for myself for this year? I turned my thoughts to my friend Kate. Over the years, she has focused not on resolutions or goals, but mantras; usually one word mantras that define the focus for the year for her. The first year I met her, her focus was “Saying Yes”. Yes to those things that scared her, yes to going out, yes to whatever life threw her way – it brought her out of her comfort zone and led to a ton of personal growth. So, how could I do the same thing for myself? Finished? Why would this word keep coming back to me? I looked around me – at the unfinished projects, unfinished goals, unfinished dreams, unfinished plans – and realized that the word was pretty close to what I needed to do in my life. But I rebelled against the word “finished”. It sounds so final. So defeatist. So done. I’m not done. I have a ton of things that I want to do with my life. Done is not what I am. I am my own biggest life project and I’m not done! So I looked up synonyms to the word finished – and one word stood out to me – Accomplished. I have projects that I want to accomplish. I have goals that I want to accomplish. I have plans that I want to accomplish. Some of these accomplishments are one and done. Most of my accomplishments in life are lifetime projects – only steps of which are truly accomplished. Writing out all of my projects, goals and dreams led me to a long list of items I want to accomplish. Some of them are easy, some of them are important and some of them are pie-in-the-sky wishes. 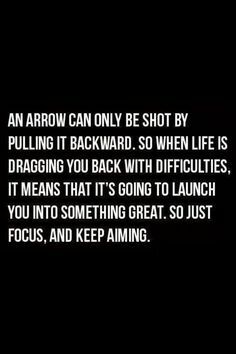 But it led to clarity in what I not only need, but want, to accomplish this year. Complete the crochet blanket I started 17 years ago. I am going to accomplish what I set out for myself. There are days when I wish this roller-coaster ride called being a step-parent was over. There are days when I wish it would never end. One wish out-weighs the other, but not because of the kids. Rather because the bio-parent in our lives makes things so much more difficult than they have to be. Last night, Jetsam called a family meeting with all of her kids. In the 15 years that I’ve been with my husband, this is the first time she’s done that. It makes me slightly uneasy because something like this, based on past experiences, typically means that she is plotting something. I shouldn’t let it bother me, but – also based on past history – whenever she’s plotting something, it always turns out negative for the kids; which in turn, turns out negative for Hun and me. Just a few days ago, Jetsam attempted to press charges against me for abuse against Monkey. Hun and I made sure that Monkey knew that the reason we didn’t allow her to call her mom on the night everything happened was because we were attempting to protect her. We reiterated everything the police officer said, that if they (the police) had been called out that night (which Jetsam would have immediately done), Monkey would already be behind bars at the Juvenile Detention Center (JDC). As it stood, now that her mom had called the police, there was still the possibility that she may go to JDC. The report was now in the hands of the detectives and DA to decide if they wanted to press charges and go forward. It doesn’t matter. They will blame me anyway. No matter what the outcome is. They will absolve themselves and Monkey of any responsibility. Monkey acts like this entire incident is no big deal. She acts like her mom is going to protect her and not allow anything to happen to her. My question to Monkey is – if the person you have put your trust into has lied to you in the past, failed to follow through on promises and cannot take care of herself without assistance from those around her – what makes Monkey think she’ll come through for her now? Maybe she ought to re-think who she’s placed her trust in. Which is really sad and makes me cry to think about. You’re supposed to be able to trust your mom. You’re supposed to be able to trust your dad. When that trust is broken, it affects all areas of your life. I suspect that Jetsam’s next step is to contact Child Protective Services (CPS) against Hun and me since the police were of no help to her. I’m not sure why I suspect this, but it would be the next “logical” step in her mind. She’ll do anything to show that we are abusive, as she’s been claiming for all of these years. I won’t be surprised to get a knock on the door and a CPS worker is standing there asking to come in. It might surprise Monkey and Jetsam that I will not hesitate to let them in. Hun and I have done nothing wrong. We have nothing to hide. My only fear/wish is that if that knock comes my house is actually clean the way I like it to be cleaned. Dad – it isn’t your fault. There, I said it. Happy? Back in November, I attempted to go gluten free. I seemed to have all of the “symptoms” of gluten sensitivity. I was as gluten free as possible without going crazy about it. And still I showed symptoms of allergic reactions to something I was eating. So I finally did the adult thing and made an appointment with an allergist. I had already been tested years ago for general allergies (I’m allergic to cats, pecan trees and mountain cedar – the bane of Texas), but I never even considered I might be allergic to the food I was eating. Do you know how hard it is to totally eliminate the above from your life? Good LORD!! It’s difficult! Try it – just do a Google search on recipes with chicken, but without milk, cheese or tomatoes. Go ahead, I’ll wait. THERE ISN’T MUCH!! Variety is the spice of life! I hate eating the same thing over and over and over again!!! Thankfully, I don’t have life threatening allergies – just food “sensitivities” to these items. The doctor recommended that I do an elimination diet to see if I truly had symptoms or if they were just reading as false positives. I told her that was a good idea since I had eaten a big bowl of Cheerios and milk for breakfast that morning! I only have to do the “elimination diet” for two weeks before adding items back into my diet and waiting for any reactions. I’ve gotten very creative with chicken this last week – CLUCK! I feel very much like I’m about to turn into a chicken. And…..at least I’ve lost 10 pounds so far….. The food sensitivity is very real though. I had lunch out with family and girlfriends a week ago. I was very good. I ordered grilled chicken, no cheese and no tomato, with fries. Within 20 minutes of eating, I was in extreme pain from my stomach cramping. This lasted for a full 30 minutes before the pain subsided. The women with me all insisted there must have been a spice on the fries that upset my stomach. I suspected cross-contamination – maybe the grill hadn’t been cleaned before my chicken touched it. It could have been touched by a beef burger, a turkey burger, bacon or salmon (all of which were on the menu) before my chicken was grilled. It makes me appreciate the hoops someone else DOES have to jump through when they do have a life threatening food allergy. While I’ve never been one to say “it isn’t a big deal”, neither had I ever stopped to consider how dangerous it could be without realizing it. I had been a “good girl”. I ordered exactly what I could eat, asked for appropriate modifications, and ate happily until the pain hit. This experience is forcing me to realize exactly how militant parents of kids with life threatening allergies really have to be. For any wayward thought I may have had in my head in the past – I’m sorry! Well….Ignorance is supposed to be bliss anyway! I was blissfully unaware what being a step-mom truly meant until I was smack-dab in the middle of it. I was blissfully unaware of what a narcissistic sociopath was until realizing that’s exactly what Flotsam is. I was blissfully unaware that I might have a life-altering condition until about 2 weeks ago. And it’s all Dad’s fault – THANKS DAD! You see, my Dad has been having some minor but worrisome health problems that he’s been attempting to get resolved for a while now. He went to multiple doctors and had multiple tests run. Each doctor said each test was fine, nothing worrisome from their point of view. He’s a healthy mid-sixties aged dude. Do you know how frustrating it is to know something is wrong with your body, but all of the “experts” and tests say you are just “fine”? I guess there is a reason they call it “practicing medicine”. So…Dad did what all self-respecting people do these days – he sought another opinion from Dr. Google. As his daughter, I know he is methodical, rational and skeptical about everything on the internet. He doesn’t take just one article seriously – he keeps researching until he either finds information to back up the claims or debunks them. The one thing he found, that kept reappearing in his research; that also matched all of his symptoms – gluten sensitivity. Since all of the doctors and tests said he was healthy – he decided to try going gluten-free to see if it either helped, harmed or had no difference in his symptoms. After being as gluten-free as one can possibly be without being a gluten-nazi about it, he stated that after 5 weeks, he’d lost 10 pounds and hadn’t felt better in years! This got me to thinking about my own health issues. Issues that can be vague, explained away as another condition or treated with medications that cause even more symptoms. 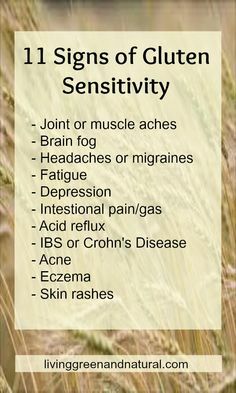 I started researching gluten sensitivities and found that a large majority of the symptoms listed on many different websites, I also possessed. 8 out of 11 symptoms – not just in my head…. So….I talked to Hun and told him I was going to start doing some testing on myself to see if my body reacts differently with and without gluten products. I went approximately 48 hours between having no gluten (that I’m aware of) and my next gluten-filled meal. Within 15 minutes of eating a dish at the company pot-luck called “Drunken Beans” (turns out the dish has beer cooked into it) – my face and chest turned splotchy, beet red and I felt flush all over like I had just run up three flights of stairs. It happened so quickly, my coworkers asked me if I was ok. I also had, after eating the beans, some flour tortilla cream cheese/vegetable pinwheels. By 30 minutes after lunch – I was burping up what tasted like cream cheese. I also had a slice of birthday cake at lunch…..which made my intestines bloat, cramp and make unspeakable noises until well into the evening hours. I’m just going to assume it was the cake that did this as it was about 2 hours after eating that this lovely set of symptoms started. NONE of these symptoms happened in the previous 48 hours – even after eating separate meals of chili, steak and pork chops. By no means is this experiment a definitive answer to the question, “Do I have a gluten sensitivity?” – but it is pretty darn close! I’ll probably, glutton for punishment that I am, test my theory several more times – just to be able to report back to my own doctor my symptoms, reactions and findings. I have a physical scheduled in February – plenty of time to test this fully. I think I’ll skip my little tests while I’m at work though….. This year brought many changes to my life. I sometimes wonder if this year marks my mid-life crisis. I turned 40 this year and as you can see from the last couple of posts, a lot of changes have happened to me and my life this year. One day I saw the beginning of a “new” trend – white tattoos. 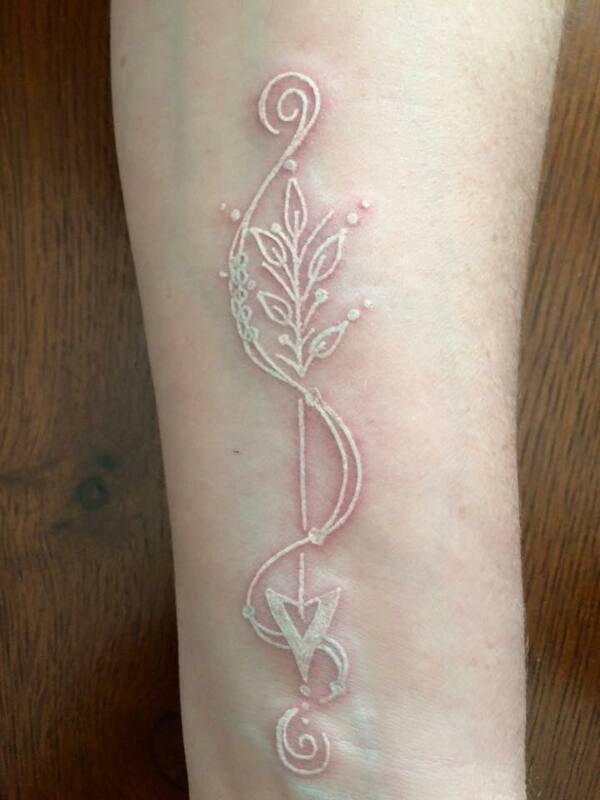 I had been thinking about getting a tattoo for years….but nothing spoke to me; until I saw the first picture of a white tattoo. The look is perfect for me – simple, elegant, understated, yet powerful. I have no desire to “stand out”. I have no reason to “make a statement”. I don’t like following the crowd. I do things for me and I don’t really care if someone else agrees with me or not. It isn’t their life, it is mine. I finally decided to take the plunge and get a tattoo. So I researched the white tattoo trend and the potential drawbacks. I found many articles such as this one. I accepted and understood the risks and started looking for a design, shop and artist whom I was willing to sacrifice my virgin body to. Next was to find a shop. The first shop I stopped in, I asked their opinion on white tattoos. Their response was, “You don’t want one of those.” When I asked why, they could only give me superficial answers, answers similar to the negative articles on why a white tattoo isn’t for everyone. I immediately looked for another shop – after all, if your first response was that I didn’t want what I wanted, then I didn’t want you to do it. I found similar responses at other shops. And then I walked into Heart N Soul Tattoo in Lake Worth, Texas and met Cherry. I asked her if she was familiar with white tattoos. Her first question was, “Are you aware of the risks with a white tattoo?” I rattled off what I had learned. She stated simply, “You’ve researched this. Do you want to see my work?” When I said yes, she flipped a photo book open to a page filled with her white tattoo creations. Stay tuned to see what greatness I am launched into next! Let me first start out by saying that I have no affiliation with the creators of this app and I have received no compensation for posting this. As I stated in previous posts, I am on a mission to getting better organized this year. One of the apps I have been using for quite some time now is the Any.List app. As the name implies, it organizes any list you can imagine while also organizing and storing your favorite recipes. Seriously, I cannot express how much I love this program. I am usually a cheapskate and I do not like to “buy” apps – even ones for a dollar will make me hesitate. So, the fact that the basic platform for this app is free, I was all over it. When I discovered for less than $10.00 per year, I could access the program from my computer and share the lists with Hun and the kids, it was well worth the cost for me! I’ll be upfront – I’ve been using the app for a little over a year now. The first couple of months was kind of hit and miss as I didn’t really utilize it like I should. Then I started building my recipe collection in the app. That was the key for MY success. Once the recipes are entered, with a single click or two, my grocery list for the week is created in less time than it used to take me to find pen and paper. I cannot remember if I was able to access other recipe websites before I upgraded to the “complete” side. The fact that I can browse the major recipe websites from the app and then it will drop the recipe I want to try into my collection with just a couple of clicks is a bonus! I don’t have to manually type anything in unless I want to – win win!! Find a recipe on Pinterest – just copy and paste – voila! Done! Okay – copying from Pinterest takes a few more clicks – but seriously – it takes my computer longer to load the websites I’m browsing than it does entering the recipes into Any.List. I have more than just my recipes and grocery lists on the app. Vacation packing – anything and everything that may be needed for a trip is listed here. I’ve used it so many times since setting it up and I have never forgotten anything on trips since! Works wonderful for over-night band trips as well. Camping supplies – again – set the list up once and I’ve used it multiple times for multiple camping trips. One-time-items-to-buy – as the list name implies, these are one-off items that I list and pick up when I’m at a store or have extra money. Christmas gifts – as the name implies – as I think of gifts for people, I put the ideas here and adjust as necessary (after all – I’m a woman – I sometimes change my mind!). It helps so I can find the best price for the item I want to give. The best part of my lists is I can set and reset the lists as many times as I want without having to recreate the list each time I need it. I can also find it whenever I need it (as long as I haven’t misplaced my phone). I’ve helped several friends get set up on the app as well. Kate over at didthatjusthappen was the first I excitedly shared the app with just a little while after I started using it. We were emailing the other day about my organization struggles and she commented that she has to-do lists everywhere (job, home, errands, etc). Then she commented that she still has a written grocery list! She has a written one because she doesn’t always have time to enter what she needs at the store into the app. One of the things I did to simplify my life was to add a “recipe” and named it “Weekly Items”. It lists everything that my family CANNOT live without in my house. Milk – check. Cereal – check. Bread – check. Laundry soap – check. You get the picture! I automatically add this “recipe” to my shopping list every.single.week – NO EXCEPTIONS! I also add any meals I plan on making for the week to the shopping list. Before I head to the store, I go through the kitchen, pantry and bathrooms and cross off anything that I already have or don’t need for the week. What may start out as a shopping list of 100+ items is whittled down very quickly (reviewing what I already have takes less than 10 minutes usually) to around 30 items. These 30 items are my “must buy” for the upcoming week. No longer am discovering that I already have 3 unopened containers of sour cream in the refrigerator once I get home. I save money with this app because I’m not buying what I don’t need. I can also focus on rock-bottom sales on things I can stock up on without guilt that I’m blowing my grocery budget. Before, it wasn’t unusual for me to spend $125-$150 on groceries for the week. Now my total is between $60-$100. For a family of 6 – that’s pretty darn good if you ask me! The hardest part of my meal planning at this point is selecting recipes for the week. That takes me longer than putting my grocery list together! Anyway – this is one area of organization that has worked so well for me that I just wanted to share with everyone! The BIGGEST drawback to this app – it is only supported on iOS phone platforms (I-phones or i-pods only). BOO!! About a month ago, I walked out on my husband. Packed my bags, had Buddy pack his bags, and we left. I have no idea how long we stayed gone. I know I planned on checking us into a hotel while I figured out my next steps. I have friends and family who have said that I’d always have a place to stay with them if I ever needed – but I didn’t want to go that route. This was between me and Hun – I didn’t need any help bashing Hun – I was doing a pretty good job on my own, both verbally and in my own head. What I needed was to talk through my frustration with someone who would understand, not lay blame and hold me accountable as well. After all – a marriage takes two to make it work. I was a wreck. Bawling non-stop clued me in that I still loved Hun – very much. I didn’t want our marriage to end, but I couldn’t handle what our life had become either. I finally decided that how I blew up and stormed out wasn’t fair to Hun. He never saw it coming and was quite frankly blindsided by the whole event. Having the benefit of hindsight a month later he might say he saw some warning signs, but I know in the moment he was clueless. So I took Buddy home and picked Hun up. We drove until finding an empty parking lot where we sat and talked for several hours – just the two of us. We decided that we did want to work on our marriage and we made a plan. I told Hun that I could not come back unless there was a plan. No plan meant I was going to accept how things were and would deal with it. That wasn’t good enough. I couldn’t deal with life as we knew it any longer the way things were. So….we’re working through our plan. We’re in marriage counseling and individual counseling. Hun is stepping up and taking on more responsibility with the kids. We’re sitting down as a couple to plan our weekly budget together. I’m going back to the doctor to make sure my medication levels are correct. And we’re trying. That’s it – we’re trying. Marriage on a good day can be hard. Adding in a second marriage with a blended family, it becomes that much harder. Add in exes who blame you for everything and poison the children’s minds against the other parent, can make a marriage next to impossible to survive. We’re going to survive – I’m stubborn remember? We will make this work. Because we hold our kids accountable to their words; and by extension their homework assignments; then we are horrible parents that expect too much from our kids. That is the take-away I received from the conversation Hun and I had with Jetsam tonight. Rowdy has a homework assignment due when he returns to school on Tuesday (from a long teacher workdays/holiday weekend). When I spoke with him about it on Thursday (as the teacher emailed me about it), he said it wouldn’t be a problem and he’d have it done. When Hun called Jetsam tonight to find out when Rowdy was coming home so he could complete the assignment, the battle was on. She finally agreed to bring him home so he could complete it as we have the materials and she doesn’t. Hun asked me to come with him to talk with Jetsam in front of Rowdy since I was the one who originally talked with him on Thursday about the assignment. Rowdy told Jetsam that he just transferred into the class on Thursday and knew nothing about the assignment. She agreed that it was unreasonable for him to complete an assignment he knew nothing about that the class has been working on for weeks. When I pointed out that he told me that he knew what the assignment was, that it would be easy to complete in 30 minutes or less, and that the class had only had the assignment for less than a week, he openly defied that he ever said any such thing and that the assignment wasn’t as easy as that (despite what the teacher’s very email states). Thus begins the cycle of what we deal with when Rowdy and Jetsam are involved. As usual, the conversation with the two of them involved frustration and anger. We’re horrible because we don’t automatically take Rowdy’s side, and by extension, Jetsam’s. When I point out that Rowdy’s own statements conflict each other, I’m suddenly accused of using “big” words to make myself sound important. Asking when Jetsam is going to hold her kids accountable is met with stonewalling and the subject changes to how Hun and I do not show the kids that we love them like she does. Reminding Jetsam that the question was about accountability, not about “feelings”, is waved away and blown off as not important. I’m then accused of not “listening” and “getting the point” about what Jetsam’s attempting to say. The reality is, she wants me to agree with her and the truth is – I just can’t. I love the kids very much – but I will not put up with them lying. Rowdy is very good at it – and gets away with it with his mom. He doesn’t get away with it with me and that makes him mad that I hold him accountable. It’s bonus points for him that his mom agrees with him because then he can rationalize that he’s right and I’m wrong because his mom believes him, so he is right!!! Because of this, she believes that so much of what’s wrong with the kids emotionally is directly tied to Hun and I and she doesn’t miss any opportunity to make her feelings known. Tonight was no exception. Twelve years, and we’re still getting slammed with everything wrong that has ever happened since the divorce and custody change. Thankfully – we had finally convinced Rowdy to go into the house, so he didn’t hear most of what was said once the “conversation” ramped up. Tonight was a little different however. Tonight, the conversation twisted and turned about how I was the instigator and the entire problem, and suddenly Hun and Jetsam were screaming at each other about how the other was lying about what happened. From my point of view – Hun was telling the truth because I remember what happened on the events they were talking about. Then it was stated that Jetsam’s mom lied on the stand to the judge at the custody hearing. She stated that she was “deeding part of her property to Jetsam, so she will never have to move again.” That was a flat out lie because she didn’t own the property, so she could not deed something that she did not own. The reality was Jetsam’s mom allowed the property to go into foreclosure a mere 18 months after we received custody of the kids; 18 months after telling the judge that Jetsam would never have to move again, and Jetsam made the choice at that time to move out of state because she had no place left to live. Jetsam went through the roof that it was implied that her mom lied. I corrected her and said we weren’t implying anything – her mom lied to the judge – plain and simple. I was flipped off, told to “go F* yourself” and that I was a “c*nt”. She repeated it multiple times while flipping me off, storming off to her vehicle and peeling out while she left. Hun and I waited until she rounded the corner of our street before turning around and walking into the house. He went and talked with the kids (because Rowdy and Monkey did hear some of the yelling and were upset with their parents yelling at each other – LaLa was gone to work) while I went and finished some chores I had been working on. I talked with the kids as well and let them know that we do love them and are here for them if they wanted to talk. Hun and I ended up meeting up in our bedroom a short time later. He apologized to me for what his ex said to me. I looked at him and just started laughing about the whole event. I told him that her words had no effect on me – that resorting to name calling at that point meant that she couldn’t rationally argue her point because what we were saying was true. We chuckled at the insanity of it all. I’ve never been called a “c” before. That’s a new one for me. My first day back to blogging and what happens? Chaos – that’s what. My life seems to be full of chaos and today was no exception. Woke up, get the kids going, take a shower and get ready for work. So far so good, right? Right. Run out the door for work; note that it’s cold, misting and miserable outside and as I’m walking down the sidewalk, I see this foamy yellowish blob looking thing on our front lawn. What the heck is that? Go over to it and it’s coming out of the cover for the water main line. No way to open up the cover without touching the blob (I’m not touching that! ), so I did what every good wife does – I ignored it until Hun could find it and went on my merry way to work. ARGH!!! Lady – we have a house full of 6 people! We cannot be without water for more than a few hours! Relay the message to Hun and we discuss a plan of action – which included digging up the yard tonight after work – after the sun goes down and when our weather is supposed to turn from mist to freezing rain. Not a good plan….but the one we figure we have to work with. An hour later, Hun’s work had no more work for him to do, so to the house he heads. He decides he’s going to dig up the yard and see what exactly is leaking. I pack my stuff up at work as well and also head to the house – if he gets to play in the mud, so do I! Well….not really – I don’t want to get muddy….but a good wife pretends that she’s there to help and at the very least hands over tools, gets a good cleavage view in or two for moral support and takes pictures of the process/progress. Dig up the front yard and discover that the coupling connecting the main line to the house line has come apart. No cracks, no breaks, just the ground shifting enough to cause a huge leak. Of course, the connections will not just go back together – oh no, that would be too easy! Did I mention that it is cold (approximately 35 degrees), misting and nasty outside while we’re digging in cold, wet ground? Realizing that we do not have the proper connections in our stash of plumbing tools, off to the big orange box store we go. Me dressed in my ski pants, goulashes, three shirts and Hun’s old work jacket; Hun dressed in jeans, shirt and jacket all covered in mud; both of us trying desperately to warm up our numb fingers. We would have fit in perfectly over at the “People of Walmart” website if anyone got a picture of us. Back home just in time for the older kids to arrive home from school and off the bus. Rowdy jumps right in to help and I’m off the hook – WOOHOO!! Hun and Rowdy spend the next 30 minutes outside as I warm my tushie and fingers. Both come in the house throwing tools and cursing under their breaths. The parts aren’t going together quite as simple as originally planned in the store aisle. Darn plumbing! Have I mentioned that we hate plumbing issues? Off to another store to get some more parts. Back to the house – thankfully LaLa now has her driver’s license – just in time to see the kids are taking off to make a bathroom run. The water is off and of course no one can hold it any longer. Rowdy has abandoned his post, so back outside I go to help. The joints will not seal without leaks. More cussing, more thrown tools and an aggravated Hun is what we’re currently reaping. The joints….oh those stupid joints…. We run out of propane for the torch – we pull out our canisters for camping and those are giving us fits. Back to the store we go….this time for the heavy duty MAP gas torch because now the igniter for the propane torch has quit working as well. It’s now after dark and the temperature has dropped sharply. Thankfully, the mist has stopped, but we’re still deep in mud and cold water. We’ve lost feeling in our fingers, our toes and our ears. Back into the hole we go. And the pipe still will not seal! ARGH!!!! Three connections later it finally seals. Finally! There is happy ski pants dancing in the streets! Our repairs only took 7 hours from start to finish…..and a whopping $85.00 (FYI – MAP gas and corresponding igniter are expensive!). But – we did it ourselves and we now have water back on to our house.